A) Today in Britain there are 124 state universities, but only one private university - the University of Buckingham. Before the 19th century there were only six universities: Oxford. Cambridge, Aberdeen, Edinburgh, Glasgow and St Andrews. Universities were usually linked to the Church and were established between the 13th and 15th centuries. They often have good reputations, beautiful old buildings, traditions and usually offer a wide range of courses. B) A number of universities were established in the 19th and early 20th centuries as a result of the industrial revolution and they began training highly skilled people for industry. 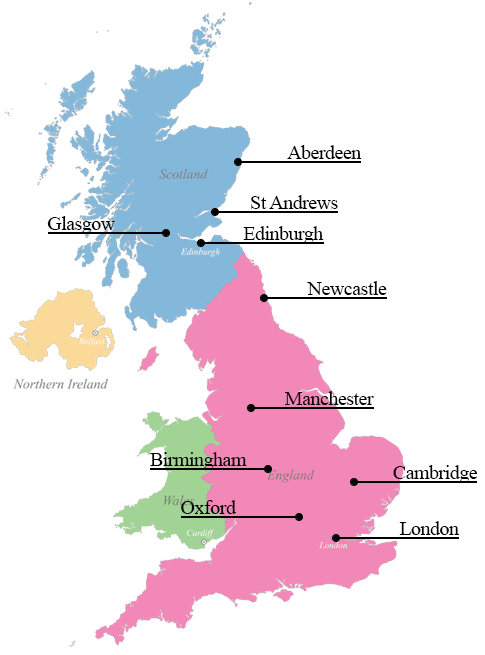 These universities were generally established in major industrial centres such as Birmingham, Manchester, Newcastle and other big cities. Sometimes called modern or civic universities, these universities have the advantage of well-established libraries, academic specialities and accommodation that is close to campus. These universities are often able to provide accommodation for all first year students. C) A number of new universities were established in the 1960s when children born after World War 2 entered the higher education system. The government decided to expand higher education to educate these students. The advantage of these universities is that they are well planned and most of the living and teaching facilities are on campus. D) Before 1992, higher education in the UK was split into polytechnics and universities. The polytechnics provided skilled people for the industries situated in their region - they focused on vocational and professional subjects. For many years, polytechnics didn't have the same influence as universities. However, by 1992, educational standards in polytechnics were as good as universities and many became universities. Many of these universities also offer diploma courses. E) These universities are made of several smaller colleges which come together to form a single university under a senate committee. There are only seven of these institutions in the UK - London University, Oxford and Cambridge are examples. Specialist colleges offer a range of courses in one discipline - for example agriculture, music, design or medicine. Some of these colleges may only offer- postgraduate programmes. These colleges are usually small, with a limited number of students. F) Universities have different locations. The older universities often have teaching facilities and student accommodation situated close together. Students in these usually socialise in a particular part of the city and there is a strong sense of community despite being in a large city. Some city campuses are situated on the outskirts of the city. These very often have the space to provide sports facilities and accommodation. They are also close enough to the city for students to enjoy city life. Some universities, notably Oxford and Cambridge, have a collegiate structure - that is, students are members of colleges within the university. These colleges are the centre of social life and academic life. Academic staff usually live at the college, and students and staff enjoy easy relationships.